Three decades’ worth of research on fish feed ingredients in Southeast Asia will be hosted in an online database that aims to reduce the aquaculture industry’s reliance on fish-derived meals and oils, as well as significantly lower the cost of feeds. Fish-derived meals and oils take up to 40% of formulated feeds especially for carnivorous species due to their well-balanced nutritional profile. “Reducing the amount of fish-based ingredients in feed formulations by using non-fish alternatives will significantly benefit the aquaculture industry,” said Dr. Roger Edward Mamauag, fish nutrition expert and head of the Nutrition and Feed Development Section of the Southeast Asian Fisheries Development Center Aquaculture Department (SEAFDEC/AQD) which is spearheading the development of the database. He said relying less on fishmeal and fish oils will lower feed prices which account for more than 50-60% of fish production cost. 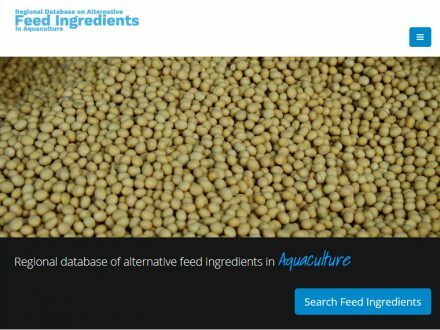 The database aims to host existing and emerging feed ingredient information in an easy to navigate platform as part of an initiative to promote awareness in the aquaculture industry that utilizing non-fishmeal based ingredients can be economical. Information culled from over 100 published scientific papers on the inclusion of these ingredients in aquafeeds had been reviewed and included in the database which may be accessed by students, researchers, aquaculturists and feed manufacturers. Alternative feed ingredients available across Southeast Asia include leguminous seed meals, leaf meals of various terrestrial plants such as ipil-ipil, papaya, and cassava as well as non-conventional sources like snails and worms. The feed ingredient database is developed by SEAFDEC/AQD in collaboration with SEAFDEC member-states and funded by the Government of Japan-Trust Fund (GOJ-TF) through SEAFDEC/AQD’s former and present deputy chiefs Dr. Chihaya Nakayasu and Dr. Koh-Ichiro Mori. “Aquaculture is a very important sub-sector in our region,” said Dr. Kom Silapajarn, SEAFDEC secretary general during the Workshop on Regional Database on Alternative Feed Ingredients in Aquaculture held in Bangkok, Thailand last 17 May 2018 participated by representatives from SEAFDEC member-states. “However, the sub-sector is faced with one very pressing concern that impedes its stable growth, which is its unsustainable reliance on fish meal and other fish-based products as sources of feed ingredients in aquaculture feeds,” he added. The increasing demand for the region’s aquaculture products means aquafeed production will likely intensify, along with the demand for fish meals and oils. The need for a comprehensive database of ingredients was first proposed during the Regional Technical Consultation on the Development and Use of Alterative Dietary Ingredients or Fish Meal Substitutes in Aquaculture Feed Formulation held in Nay Pyi Taw, Myanmar on 9-11 December 2014 in an effort to widely disseminate information on alternative feed ingredients generated from numerous researches conducted in the region. “I think this is a very important initiative. We can mobilize other professionals in the feed industry, and from the regional laboratories, we can get as much information as we can,” said Dr. Yuan Derum, coordinator of the Education and Training Programme of the Network of Aquaculture Centers in Asia-Pacific (NACA). “And we put all the information together, make it available for people who are interested and who will really use it to formulate economical feed for small-scale farmers,” he added. “It’s a necessary database because it will serve as reference for the different stakeholders, whether they are aquaculture practitioners, students, or any industry players because the information that will be contained in the database are pertinent information as to the use of locally available or alternative feed ingredients, their levels of inclusion in the diet, and their effects on the biological performance of the species,” commented Dr. Frolan Aya, a fish nutrition expert from SEAFDEC/AQD who is involved in the development of the database. The database will be officially launched on 13 July 2018 coinciding with SEAFDEC/AQD’s 45th anniversary.